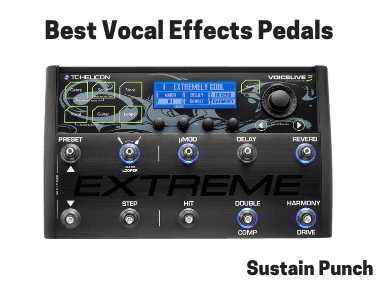 Are you looking for the best vocal effects pedals and vocal processors for live performance and recording in 2019? If you are, welcome to Sustain Punch, and let’s get started! What exactly are vocal effects pedals? Who requires a Vocal Effects Processor? Firstly, for people who are new to using vocal effects processors, let’s talk about what exactly they are and how they are used. Vocal effects pedals are electronic devices used in both a live and studio environment to enhance a lead or backing vocal with an underlying vocal effect, this could be Reverb, Delay, Echo Flange, EQ, Low-Pass Filter, Pitch Correction/Autotune, etc. These effects are often used by artists, live on stage, to emulate the studio-version of a particular song. Although vocal effects processors are used in a studio environment, to add an effect to an existing vocal take, they are more often used in a live performance environment. Being a singer myself, I realise that other singers will have different vocal requirements for what they want in a vocal processor. So this article will focus on the best vocal processors that offer singers multiple features/effects in a single stompbox. So you can get the most usability for your buck! Any vocalist who performs on-stage and is looking to improve the overall sound of their vocal performance would find a vocal effects processor useful. Some people, mainly ‘vocal purists’, may not look kindly on the use of vocal effects pedals that digitally alter the sound of a singer’s natural voice; and although such artists who have built a career on heavy use of vocal effects I.E Cher, T-Pain would disagree with this opinion, it’s certainly clear that other instrument players are not criticised with the use of live digital enhancement, making the point against singers using vocal effects processors quite irrelevant and somewhat short-sighted. Now, I can understand the point that some people make, about wanting to see a live performance of a vocalist, and not want to hear the equivalent of a robot singing on-stage; But what people fail to realise is that all vocal effects can be controlled, monitored and limited, and therefore subtle use of these effects can have dramatic effects on the vocal performance; making it sound utterly natural. Perhaps you’re looking at vocal effects processors because you naturally sing slightly flat/sharp in places and want to have a subtle amount of pitch correction, alongside some enhancements such as EQ and Limiting. Although you can train to improve your pitch accuracy and vocal tone over a period of time, there will always be fluctuations in your v0cal performances, and this is felt by new singers to experienced singers. Therefore incorporating a vocal effects processor can limit the unpredictable nature of the voice, giving you some reassurance that you will be able to iron out some of the minor mistakes within a performance because after all, you want to give the audience a fantastic performance. There are a variety of different vocal effects processors available on the market; Some of these pedals have specific single uses, an example being vocal looper pedals, vocal autotune pedals, etc. Other vocal effects processors have a range of vocal effects integrated within the same physical unit. Because of this, the unit is slightly more expensive than if all of the aforementioned effects were purchased separately. There are other vocal effects to choose from, there include, vocal delay, reverb, echo, doubling, chorus, etc. All of this equipment would cost hundreds and hundreds to purchase… So it’s worth making a decent initial investment into a vocal multi-effects pedal, (this is only if you’re looking at having multiple vocal effects in one unit). Also, each pedal has it’s own unique means of operation, therefore having multiple pedals from different brands would require more effort on the singers part to operate, which isn’t great when you’re in a live environment, trying to give the audience a vocal performance of a lifetime. However, we understand everyone has a budget, so we’ve given out the recommended solution at different price-points, which are represented by the $$$ the dollar icons. As you can see from the VoiceLive Play, Electric & Acoustic comparison chart. Despite the pedals looking very similar and having an identical core functionality, there is a huge difference in guitar effects functionlity. We realise that all of these pedals are created by TC Helicon. That’s no surprise since they are one of the companies leading the way in voice/vocal effects for singers. The multi-effects vocal solutions we offer are certainly a must for singers looking to transform their performance. When keeping in mind the sheer amount of effects that each of these processors provide, you really do get a surplus of functionality for the price.